This was my first time tasting lavender and I was told it was an acquired taste, something I would either love or hate. Luckily, it was something I loved and I happily wolfed down this bowl of blueberry & lavender porridge. 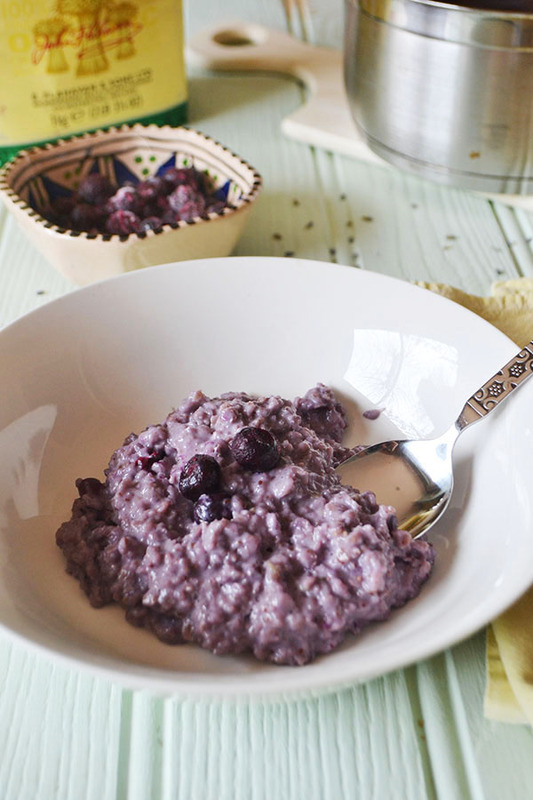 Heat the blueberries in a saucepan with a drop of water until the water turns purple and the blueberries soften. Stir in the porridge oats and milk. Bring to the boil and simmer for 3 minutes, stirring continually. Take off the heat, serve and enjoy hot! Hi Kim, I usually use culinary lavender bought from the spice section of the supermarket. Some supermarkets do, some don't but I know for a fact that Waitress do (if you're in the UK!) You can also buy edible lavender online, specialist food stores or some food markets.